A team from Ecology braved the cold and joined more 100 volunteers to plant trees at a local beauty spot to help it recover from the ravages of disease. 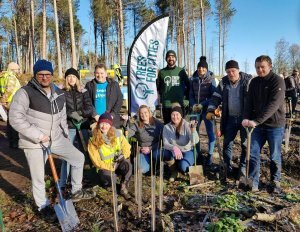 The recent event at Betty’s Wood on the St Ives Estate near, Bingley, West Yorkshire successfully planted 1,500 saplings . The saplings were planted in an area where larch trees planted in 1948 as a commercial crop had been cut down in response to the discovery of the disease Phytophthora ramorum, which is also known as the ‘plant destroyer’. A total of 19 native tree species were planted with the aim of producing a high canopy mixed with a varied understory to encourage wildlife. The tree planting was organised by Bradford Metropolitan District Council carried out in partnership with Trees for Cities, which had received funding from their corporate partner Npower, and the Friends of St Ives Estate. 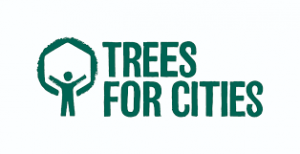 Ecology’s members and supporters recently selected Trees for Cities as our AGM voting charity partner, in an online poll. The Society is committed to supporting volunteering for good causes and allows colleagues to take up to three days paid leave for volunteering in their local community.